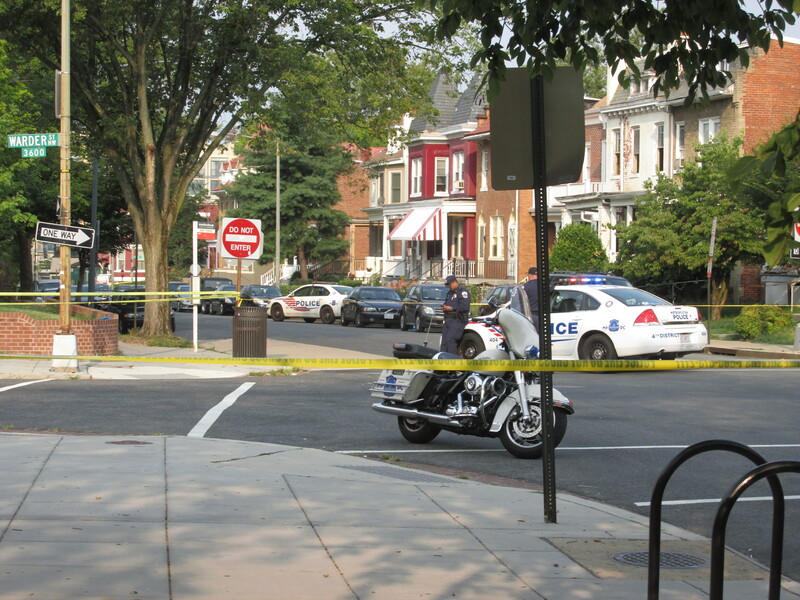 Investigation Continues in Weekend Homicide | Park View, D.C.
Police at Warder and Rock Creek Church Road as part of homicide investigation on August 9th. Late Friday night, August 8th, shortly after 11 pm, there was a shooting resulting in a homicide at the intersection of Warder Street and Quebec Place, NW. Residents in the area awoke to find an active police investigation and the 3600 block of Warder, along with the 700 blocks of Quebec and Rock Creek Church Road blocked off to all traffic. Late Saturday afternoon, a property of interest related to the homicide on Rock Creek Church Road was also visited by the police and evidence removed from the property. Below is a news clip from News Channel 4 that accompanied their story which provides some information related to this tragic event. This entry was posted on August 10, 2014 at 9:32 am and is filed under Crime, MPD, Shootings. You can subscribe via RSS 2.0 feed to this post's comments. These things cannot be allowed in our neighborhood. I understand there was a basketball game that got out of control. Why are there not MANY more police at these sorts of gatherings. I hope MPD is paying attention. So what are we as a community going to do about it? Kent — any meeting planned with MPD, DPR? This was extremely tragic and distressing. I am still unclear on the connection between the basketball tournament and the shooting. If they were connected in any way I would hope that we could either force DPR to move the event to a different venue, or at least press for much tighter security and an afternoon time slot. Agree if this was connected to the tournament then that needs to be addressed, I am also concerned at how late the tournament goes on throughout the summer for several nights a week. Yes, when did the decision get made to allow the tournament to end at 10pm (actually, it’s often later)? Why not have it during daylight hours? Even Saturday/Sunday afternoons? Kent, have you walked the streets on tournament nights? There’s a lot of spill over into the neighboring blocks. Partying, blocking traffic, drinking, etc. Now, someone else’s son had died. Should we add his name to the tournament? So it’s been almost a week, and there’s no response from either Kent or the DC Police on this homicide…? I’ve never lived in a neighborhood that seemed so blase about violence.